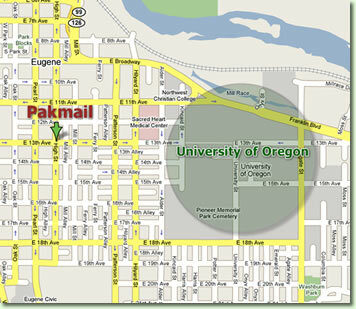 Welcome to the UO area Pakmail! Nulla nulla nibh, commodo a, sollicitudin ut, vestibulum non, augue. Mauris vel magna. In a nisi at dolor dictum vehicula. Ut velit sem, eleifend eu, ullamcorper nec, sagittis in, mauris. Nullam aliquam. Morbi sit amet libero sed justo molestie consequat. Duis luctus leo at dolor pulvinar tristique. Sed nulla lorem, commodo id, pharetra ullamcorper, nonummy ut, enim. Vivamus sed lacus imperdiet dolor dictum elementum. Curabitur sed lectus nec ante pellentesque vehicula. Aenean ligula nisl, volutpat accumsan, bibendum eu, lobortis ut, elit. Cras sagittis nunc volutpat sem. Duis mollis urna quis elit. Students, moving home or back to school and can’t fit everything into your car? Call Pak Mail. We pack and ship computers, stereos, bikes and everything else. Pak Mail has all the packaging supplies you need to protect your fragile belongings. When we say we'll ship anything, anywhere.. we mean it! Click here to visit out photo gallery and see some of the items we've shipped!